In 1959, John Scurlock discovered his employees engaging in a surprising activity. A successful engineer, Scurlock had lent his inventive expertise to both the oil and gas industry and to projects at NASA, and then decided to turn his attention to tennis, a sport he loved. What he came up with was a rapidly inflating cover that could be spread out to protect a clay tennis court at the first inkling of rain. His invention may have been great for that, had his employees not discovered that it was also quite bouncy. What Scurlock quickly realized was that his adult employees might actually have been incapable of resisting the urge to bounce and that what he’d invented was not a tennis court cover at all. Instead it was a play structure that he called the Space Walk. Over the next decade, Scurlock’s invention got a little safer (with the addition of walls) and he entered the rental business, providing hours of bounce house fun for birthday parties, school fairs, and company picnics. But even though it has obvious adult appeal, bounce castles have generally been considered the realm of children. 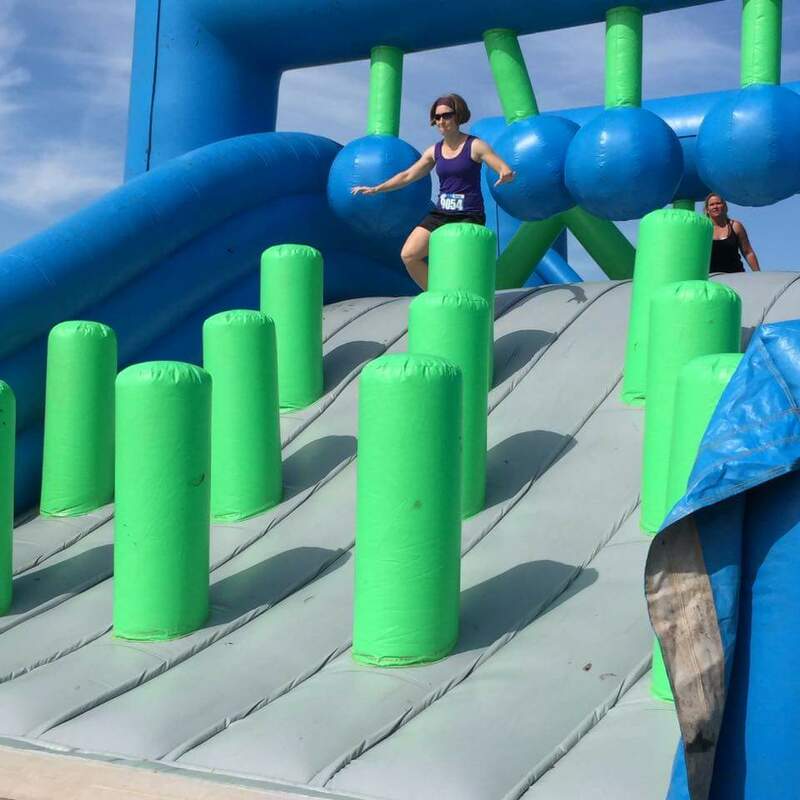 For the past couple of years, a new themed run has swept across the US and Canada, called the Insane Inflatable 5K. The event is pretty much exactly what it sounds like. It’s a 5K with about a dozen inflatable obstacles set up along the route. Participants climb, jump, slide, fall, and yes, bounce. Often on purpose. Sometimes on their backsides. Because it’s super fun. These were some (sort of) serious obstacles. It was kind of like a short Tough Mudder, except for people who don’t like to get muddy and really aren’t that tough. While there’s no age restriction for the event, the participants are pretty overwhelmingly adults. At least that was true at the one in which I recently participated. If you’ve been reading this blog for long, you may have stumbled across the fact that I believe in my heart of hearts that running is stupid. But (and I realize that this is a bit hypocritical of me) I also really enjoy participating in race events. I love the camaraderie that comes from accomplishing something challenging in the midst of so many other people who are also accomplishing something challenging. I love the cheering and encouragement that comes from fellow race participants and from those who are watching from the sidelines. And, I admit it, I can’t resist a silly theme. So when I got the opportunity to participate in the Insane Inflatable (or as we more often referred to it, the Bouncy House 5K), I couldn’t pass it up. In fact, when the group I was originally planning to register with began to waver in their enthusiasm, I found another group willing to go on an earlier date. The event wasn’t timed, but I did get a medal. So I’m basically an Olympian now. John Scurlock’s employees realized that in 1959 and an amazing industry was born. What fun! Congratulations for completing your bouncy adventure. The idea (altho perhaps not the activity) is appealing, and just enuf offbeat that I’d like to join in (passively, of course, as my running days are over). Where do I send my cheque to get one of your tee-shirts? Seriously. I don’t know how you manage it, Sarah, but you’re a promoter w/o even trying.